I'm always looking for healthy veggie recipes that my whole team can enjoy... It's not easy. While I was thumbing through my yoga journal magazine last week this recipe caught my eye-btw...I don't like pesto but this is an exception! I love kale and it turns out that we all love it and this recipe. Another yummy easy vegetarian meal to put in my repertoire. 1. Bring a large pot of water to a boil. Meanwhile, fill a large bowl with ice & cold H2O. 2. Plunge the kale into boiling water for 3 minutes. With tongs transfer the kale to the ice water. 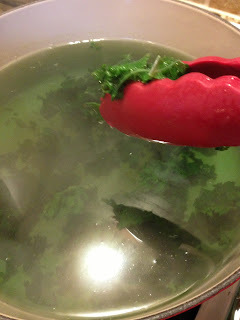 Drain kale in a colander and squeeze out excess water. 3. 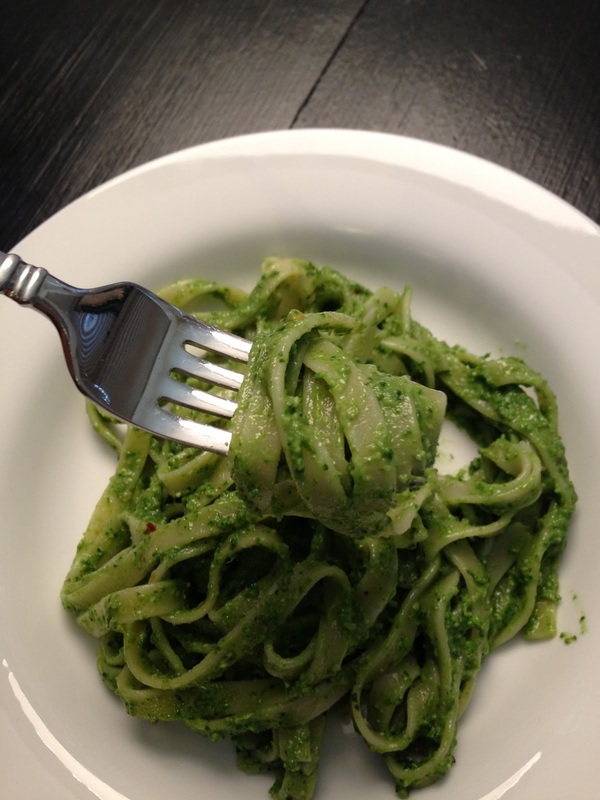 Puree the kale in a food processor with 1/2 cup cheese and remaining ingredients (except pasta) until smooth. 4. Return water to a boil and add the fettuccine. Cook according to package directions until al dente. 5. Just before the pasta is done, remove 2 T pasta cooking water and add it to the kale pesto. Add remaining 1/2 cup cheese and mix well. 6. Drain the pasta, and then toss with kale pesto. I followed this recipe to a t. It was a little too dry, a little spicy for the kiddos and a tad too salty for our taste buds. So FYI...next time I make this (and if you like less heat & salt try this) I will adjust the ingredients and use 1/2 tsp of salt, 1/8 tsp red pepper flakes and 4 tablespoons of pasta water. sounds yummy. will have to try. Thanks so much for sharing.